The voice of rugby league, Ray “Rabs” Warren, will call the action from the Wide World of Sports commentary box alongside Peter Sterling, Phil Gould and Paul Vautin. James Bracey will host Nine’s State of Origin II coverage, flanked by rugby league Immortals Andrew “Joey” Johns and Wally “The King” Lewis, plus Origin legends Johnathan Thurston, Darren Lockyer and Paul Gallen. Nine is the only place to be on Sunday, with a mammoth day of coverage starting with live crosses to ANZ Stadium on Weekend Today from 7.00am, followed by a blockbuster edition of Sports Sunday at 10.00am, an Origin game day special of The Sunday Footy Show from 11.00am, and Nine News at 6.00pm combining to deliver viewers a build-up to Origin like never before. Nine’s Director of Sport, Tom Malone, said: “This is like Grand Final Day and State of Origin all rolled into one. With Freddy’s Baby Blues trying to seal the series, and Kalyn Ponga and Billy Slater in for Queensland, we are so excited about this clash. Available anywhere, anytime on 9Now will be five streams: the Main program, Tryline Cam, Spider Cam, NSW Player Cam focused on Origin I Man of the Match and dynamic Blues fullback James Tedesco, plus QLD Player Cam following Maroons superstar Billy Slater. Instagram, or join the chat on Twitter using #Origin. • 7.00am – WEEKEND TODAY: Join Allison Langdon, Peter Stefanovic and Jayne Azzopardi to start your day with all the latest news from around the world before they cross LIVE to Julie Snook at ANZ Stadium. • 10.00am – SPORTS SUNDAY: Liz Ellis, Peter Fitzsimons, host James Bracey and former NSW Blues representative Adam MacDougall will cover a massive day of sport from around the globe. Former Socceroo Zeljko Kalac delivers the latest from the 2018 FIFA World Cup in Russia, former Australian cricket captain Mark Taylor analyses Australia’s record ODI loss to England, and the man who starred in Origin II last year with a clutch sideline conversion, Johnathan Thurston, joins the show in the studio before the big game. 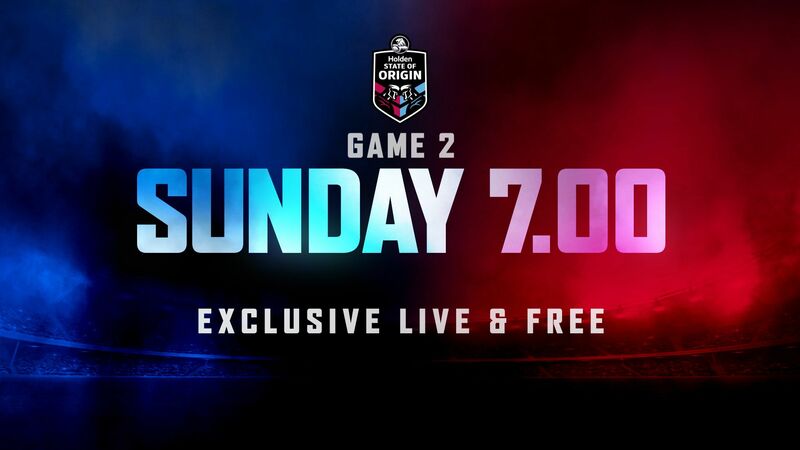 • 11.00am – SUNDAY NRL FOOTY SHOW, Origin Game Day Special: Host Peter Sterling presents an Origin II game day special with rugby league royalty Johnathan Thurston, Wally Lewis, Darren Lockyer, Paul Gallen and former Jillaroo, Allana Ferguson. The panel cross live to both camps with under eight hours until kick-off. • 1.00pm – SUNCORP SUPER NETBALL: Collingwood Magpies vs Melbourne Vixens. • 6.00pm – NINE NEWS: Your favourite nightly news service will deliver the most up-to-date news in the last hours before Origin II. Led by Cameron Williams and Wally Lewis, Nine’s expert rugby league reporters Danny Weidler, Neil Breen, Julie Snook and Danika Mason will have the biggest stories from either side of the border. • SIX TACKLES WITH GUS – REP ROUND: A weekly insight into the thoughts on all things rugby league before a huge weekend of representative-round football with one of the most knowledgeable and analytical minds in the game on the Six Tackles with Gus podcast. James Bracey will discuss the biggest rugby league issues of the week throughout the series with NRL legend and expert commentator Phil Gould.